Passive income is a new word for some and a way of life for others. Passive income is described as additional and discretionary income outside of normal earnings from a job or a business. 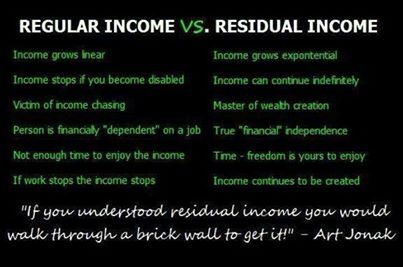 This type of income has created more financially sound and stable individuals than any other method of payment. If this is so, why isn't everyone getting rich if earning passive income is so easy? Is it the fact that most people are struggling with their own passive income streams or maybe most don't know how to earn it? And the big mystery is..... Why are there people who think passive income is a scam, while others are making hundreds of thousands of dollars every year earning it? Some of America's wealthiest individuals are proof that passive income is real and not a scam like Warren Buffet, Bill Gates, Martha Stewart, David H. McConnell, Mary K. Ash, etc. Many of these individuals are founders of their own organizations from big corporate entities to network marketing companies. Bottom line.... There is never an excuse to be broke and without passive income unless you have a closed mind and rely solely on the belief that you will never need it. The truth is you have a greater chance of needing it than not needing it. Passive income creates lifestyles, it provides income on a consistent basis and it leaves a legacy for generations to come. Why are there people who think passive income is a scam while others are making hundreds of thousands of dollars every year? THE ANSWER: because they do not know the secrets behind the passive income opportunities and earners. Listed below are 3 secrets to earning consistent, passive income with the opportunity to create generational wealth. Secret #1 Passive income is NOT a get-rich-quick scheme Many people think earning passive income is easy and never expect to put any hard work into it. The truth is, just like any business venture, a passive income opportunity will cost you time and effort before it brings you any decent income. For instance, to sell an eBook on Mexican food recipes, you need to spend time planning its content, compiling information, writing it, editing it, formatting it and marketing it. The whole process could easily take months before you earn your first buck of passive income. Unfortunately, many passive income seekers enter the business with the wrong mindset and give up when things do not meet their expectations. ARE YOU TIRED OF LIVING PAYCHECK TO PAYCHECK? EARN EXTRA INCOME TODAY. Secret #2 In order to earn passive income, you must be persistent To be a successful passive income earner, one not only needs to be innovative but also be persistent. Receiving monthly rent on your rental property might be easy, but you still have the responsibilities as the landlord and you will be the person the tenants call when something in the property goes wrong. The same thing applies when selling eBooks online where you need to update your websites with new information and features to keep the clients coming back. The same goes to say, if you start a business, no matter what type of business, you must work every day to make a sale and inform in order to create the income you desire. Expect to do follow-up on the source of your passive income so that it keeps generating money for you in the long run. Secret #3 In order to build passive income, it's best to work on it while you are employed Many people misunderstood that active income and passive income are mutually exclusive. They are not, at least at the beginning! It is not practical to quit your day time job just to build your passive income streams. If you do, you are only creating more tension to your financial situation because you would have to rush and squeeze money out of your passive income when in need. Instead, the most logical and methodical aspect of building a financially secure foundation is to focus on developing your passive income while still receiving your steady monthly pay from your employer. Look out for the long term. Upon building a nice nest egg, if you are dismissed from your job or if you decide to take a break, you have the option to do so with little financial concerns. Passive income is NOT a scam. It is a viable means of income. Many opportunities provide avenues in order to make it happen. The key is to find something you enjoy doing and would do it over and over again. Read, investigate and continue to be vigilant in how you can improve your financial life. Are YOU Inspired or Are YOU Motivated?